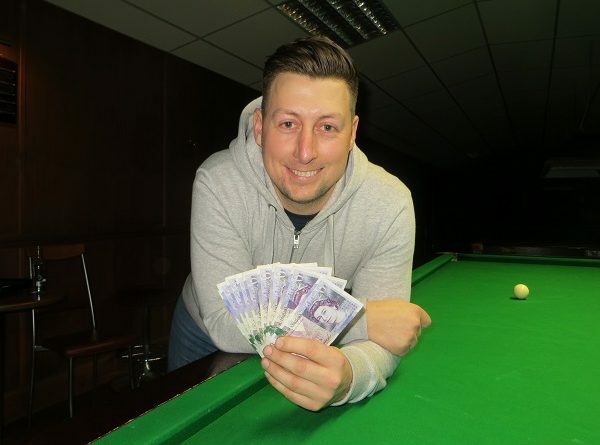 BIRTHDAY boy Sean Harvey recorded a monster century break and collected £200 for winning a second successive tournament on a regional snooker circuit. The Surrey star followed his victory in Havant in November by beating Nick Jennings 2-1 in the final of the fifth leg of the Cuestars Championship Tour. Earlier, Harvey, who hails from Longcross, celebrated his 34th birthday at Fareham Snooker Club by firing in the day’s highest break of 133. The clearance came in the first frame of his 2-0 group-stage victory over Neil Craycraft (Didcot) on a professional standard table. It was the tenth highest break recorded in Cuestars history. “I’ll take that as a birthday present,” smiled Harvey, who is rated by many in the game as the best amateur in the south not to have made it onto the professional circuit. “I was happy with that. He left me a long red. I got it in and took them well. In the final, Harvey took the opening frame by a distance. But Jennings (Otterbourne), playing his first Cuestars event for three years, forced a decider on the final black in the next after some excellent safety play by both players who had qualified for the knockout from the same four-man round-robin group. Harvey set off like a train in the third. A second bite of the cherry after breaking down on a run of 36 resulted in another 57 points and a handshake. Talking about the second frame, Harvey said: “We both played some good safety. And reflecting on the day overall, he added: “I’ve not played great. I’ve just managed to do enough and get through. Harvey’s 133 eclipsed the 72 made by 15-year-old Jamie Wilson (Havant) on the same table against Steve Wheatland (Bishopstoke). Jennings had knocked out rankings leader Mark Lloyd (Gosport) by a 2-1 scoreline in the last-four. Aldershot hotshot Ryan Mears, who is second in the rankings, hadn’t dropped a frame before his 2-0 semi-final defeat by Harvey. Lloyd maintains his eight-point lead over Mears. Harvey climbed to third place. The event sponsored by London-based brewery Fuller’s attracted 32 entries. The sixth leg of eight is at Frames Sports Bar, Coulsdon, on Sunday, February 10. For more information about Fuller’s, a family-run London brewery established in 1845, go to www.fullers.co.uk/brewery. Sean Harvey: 133, 57, 57, 53, 51. GROUP A: 1st, Mark Lloyd (Stoke SC, Gosport); 2nd, Kevin Impett (Salisbury SC); 3rd, Andrew Darken (Chertsey SSRN Club); 4th, Stu Barter (Chandlers Ford SC). GROUP B: 1st, Ryan Mears (Sovereign, Farnborough); 2nd, Ronnie Blake (Frames, Coulsdon); 3rd, O’Shay Scott (Chandlers Ford SC); 4th, Antony Foxcroft (Salisbury SC). GROUP C: 1st, Pascal Richard (Mayfair, Gosport); 2nd, Dan Sykes (Chandlers Ford SC); 3rd, Elliott Weston (Top Spot, Havant); 4th, Anthony Rice (Salisbury SC). GROUP D: 1st, James Budd (Stoke SC, Gosport); 2nd, Pete Ferguson Jnr (Craneswater SC, Portsmouth); 3rd, Riccardo Drayton (Chandlers Ford SC); 4th, Christian Chislett (Churchills, Eastleigh). GROUP E: 1st, Jamie Wilson (Waterlooville Sports Bar); 2nd, Steve Wheatland (Chandlers Ford SC); 3rd, Martin Wallace (Crucible, Newbury); 4th, Ally Pollard (Salisbury SC). GROUP F: 1st, Sean Harvey (Staines Cons); 2nd, Nick Jennings (Churchills, Eastleigh); 3rd, Neil Craycraft (Jesters, Swindon); 4th, David Rice (Salisbury SC). GROUP G: 1st, Ryan Hughes (Chandlers Ford SC); 2nd, Mike Trigg (Cue T’s, Marchwood); 3rd, Ross Barker (Abingdon Cons); 4th, Arron Smith (Selsey RBL). GROUP H: 1st, Jack Smithers (Frames, Coulsdon); 2nd, Steven Hughes (Chandlers Ford SC); 3rd, Darren Johnson (Petersfield Bowling & SC); 4th, Mark Ridout (Greenbaize, Bournemouth). LAST-16 (10 points): Lloyd 2-1 Blake, Smithers 2-1 Trigg, Jennings 2-0 Wilson, Sykes 2-1 Budd, Richard 2-0 Ferguson, Harvey 2-0 Wheatland, S Hughes 2-0 R Hughes, Mears 2-0 Impett. QUARTER-FINALS (12 points): Lloyd 2-0 Smithers, Jennings 2-0 Sykes, Harvey 2-1 Richard, Mears 2-0 S Hughes. SEMI-FINALS (£20, 15 points): Jennings 2-1 Lloyd, Harvey 2-0 Mears. FINAL (£200/£80, 25/18 points): Harvey 2-1 Jennings.